Frustrated by the continual clutter and disarray of posting content on Facebook, Twitter, Instagram, LinkedIn, Snapchat, billboards, etc.? How do social media experts keep all of these organized? One simple solution: content calendars. How should I organize my calendar in terms of periods of time? Do I need to organize my calendar day-to-day? A month at a time? Seasonally? An entire year at a time? What platforms will I need to include in my calendar? Will I make one large calendar that includes every platform? Or will I make separate calendars for each individual platform? Will I post on these platforms multiple times per day? Will I need to specify what times to post content? What types of content (ie video, blog, promotion, live video) will I be posting? Will I need to specify this? Does this content have a specific topic or campaign associated with it? Is there an image? If so, what is it? Additionally, looking at templates online may give you exactly what you need, or even some partial inspiration for your content calendar. Hootesuite’s blog is a great source for learning more about social media and content planning. It has tips for beginners as well as templates to get you started. Although content calendars may take extra time to set up, they save time in the long run. Once a workflow is set up, it’s a simple input of information into the calendar each day, month, or year. 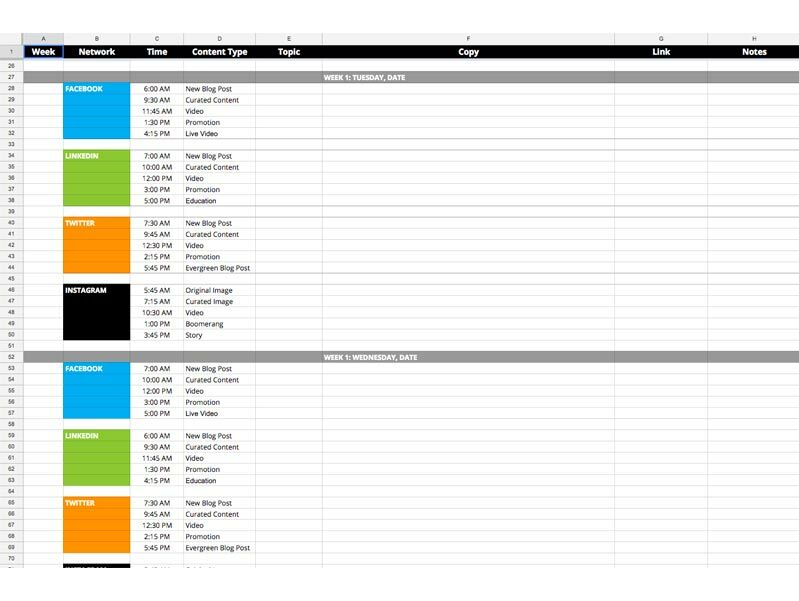 If the calendar is created via Google Sheets, it makes it even easier to share with a creative team, client, etc. so multiple people can view and/or edit the content all at once. Content calendars also allow you to see what content is successful and what content is not. They provide a better understanding of which types of posts are most/least popular, which times are most/least popular, or what kind of audience likes a certain type of post. Keeping track of this information will help you plan future content with more success. Even though every content calendar may be set up completely different, all of them have the same function: keep your content organized.